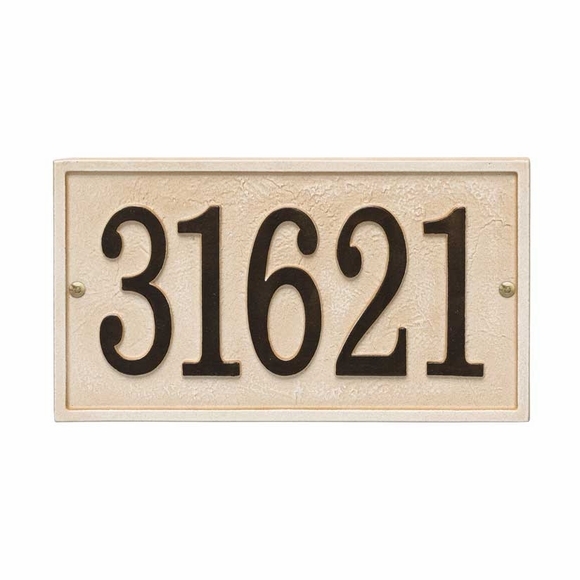 Southwestern Theme Home Address Sign - - personalized cast aluminum house numbers plaque. Made in USA. Stonework style address plaque is manufactured from high-density aluminum alloy and has a real crushed-stone appearance. The weathered limestone/dark bronze color combination blends in beautifully with southwestern colors and decorating influences. Vertical sign holds up to four (4) 4" numbers. Rectangle, Oval, and Arch signs holds up to five (5) 4" numbers. Available in four popular shapes - - rectangle, oval, arch, and vertical. All signs weigh 1.7 pounds. Rectangle house numbers sign: 11.0"W x 6.25"H x 0.25"D.
Oval house numbers sign: 12.0"W x 6.75"H x 0.25"D.
Arch house numbers sign: 12.0"W x 7.25"H x 0.25"D.
Vertical house numbers sign: 3.50"W x 19.0"H x 0.25"D.
Finished with Alumi-Shield™ all-weather protective coating designed to handle harsh temperatures and environmental elements. One piece custom casting construction, including the numbers. Easy to install with just two brass screws (included)! Southwestern Theme Home Address Sign personalized cast aluminum house numbers plaque. Made in USA. Beautiful classic sign for my stucco house. Color matches my nearby light fixture perfectly!